When shopping for Vacuum Sealer Bags it can often be confusing to know where to start, our "How to Choose Guide" looks at the most important features and aspects of the most popular models, explains why they are important and what you should be looking at when making your decision. You may also find our Vacuum Sealer Bags Frequently Asked Questions or Vacuum Sealer Bags Buying Guide helpful. What Brand of Vacuum Sealer Bags will work in your Vacuum Sealer? Each different brand of vacuum sealer has designed their machine to operate at a slightly different temperature, so using Vacuum Sealer Bags from other manufacturers can be problematic, as they may not seal properly or may melt creating a mess or causing damage. However, this doesn't mean you're forced to only buy bags from one company. You can buy Generic Vacuum Sealer Bags also known as Universal Vacuum Sealer Bags that will work in most vacuum sealer machines. The following brands of Vacuum Sealer Bags are Universal Vacuum Sealer Bags: OutOfAir Bags, FoodVac Bags, Avid Armor Bags, Simple Houseware Bags, Nutri-Lock Bags, CaseKix Bags. FoodSaver Bags are also universal. Should You Buy Pre-Cut Vacuum Sealer Bags or Vacuum Sealer Bag Rolls? This is an answer that's going to vary from person to person depending on what features their vacuum sealer has. Many brands of Vacuum Sealers hav a spot for on-board bag roll storage, most of the FoodSaver Vacuum Sealers have this feature. It's a convenience feature, but it's something you'll appreciate if you do a lot of vacuum sealing or Sous Vide cooking. Using rolls allows you cut the bags down to size, reducing the amount of bag waste, which saves you money in the long run. It's not a huge amount of money, but it will add up over time. If your model doesn't have on-board storage, we suggest going with pre-cut bags. 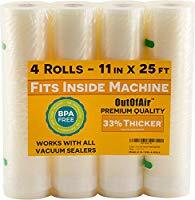 You may think you'll be able to keep track of where the roll is, and find a pair of scissors quickly, it's never going to be as easy as you think. Additionally trying to cut a bag off a roll when you've got raw meat on the counter introduces a lot more opportunity for cross contamination. 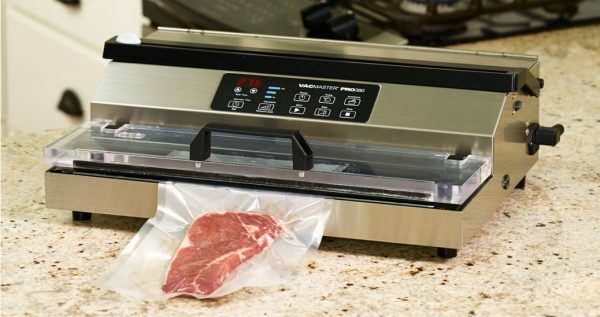 What Thickness Vacuum Sealer Bag Should I Buy? First we need to talk about how Vacuum Sealer Bag thickness is rated and why there are two different measurements. Vacuum Sealer Bags are measured in Mil, 1 Mil is 1/1000th of an inch, this IS NOT the same as 1 millimeter. Vacuum Sealer Bags have a smooth side (this is the front), and a textured side (this is the back). The back is almost always thicker than the front. The texture on the back is actually microscopic one-way air valves that allow air to escape but not get back in. Bags generally have a thickness between 3 Mil and 5 Mil on the front, anything 4 Mil or higher is considered a Commercial Grade Vacuum Sealer Bag. Commercial grade bags include: OutOfAir Bags, FoodVac Bags and CaseKix Bags. Most Vacuum Sealer Bags have a back that's 9 Mil or 10 Mil in thickness. FoodSaver Bags have a back thickness of 11.5 Mil, and CaseKix Bags have a back thickness of 12 Mil. If you are storing food for short periods of time (30 days or less) or are cooking Sous Vide, you don't need to use thicker bags. If you are storing food with bones in it (like game meat) or are storing foods for longer periods of time, you will get better results with thicker bags. How Can I Get a Better Seal on Vacuum Sealer Bags? If you find you aren't getting as good a seal as you would like, your bags aren't sealing properly, or there are gas in your sealing there are a few things you can do. The first tip is to cut your bag slightly larger than you need, then before you put the food in, roll the top of the bag back (see picture). This prevents moisture from getting on the edge of the bag where you're going to seal it, it may seem like a little thing but it definitely improves your results. The next tip is to make sure the textured side of the bag is on the bottom this really matters if you're vacuum sealing liquids or foods with a marinade. Keeping the textured side down allows the vacuum seal pump to achieve a tighter seal. The FoodSaver FM5200 is our highest rated vacuum sealer, it has all of the convenience and features that most people are looking for in a vacuum sealer, at a great price, from the FoodSaver company.